Sometime in the last 24 hours, my Myki online topups finally got resolved, some 24 days after they got stuck. Last week I used the web site feedback form to point out that the topup from 2/3/2010 had got stuck, and the one from 4/3/2010 was stuck behind it. They unjammed it somehow, and by Saturday morning, the first had successfully completed and the second had been transmitted to my card. Confirmation that it got to the card was received back at the central servers sometime last night, some 24 days after the transaction was initiated. Glad that it’s resolved, but not impressed. I haven’t changed my thinking on this: avoid online topups. ← Previous Previous post: It’s Mario month! 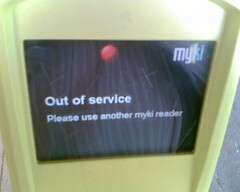 Avoid myki until it works is my suggestion. I got my initial top-up credited to my card some 6+ weeks after the initial online account set up. Dolts! I’ve done about four test topups in the last week or so and every one has reached my card in less than 24 hours (which should be changed to “overnight”). One would hope that the horror problems are behind us, as least as far as new topups go, but it sounds like there are still a number of horror stories hanging like yours, Daniel. I’d go so far as to tell people to give it a go but would ensure they are aware there is no way they should rely on it, though I’m cautiously optimistic (watch it all turn to crap again in the next week now I’ve said that). Beach and touching off their Mykis. With minimal delay and hassle. PS I couldn’t find the Myki touch-on/off poles at Elsternwick as they are located nowhere near the metcard validators! LOL yes Roger, Elsternwick does seem to be a special case. It’s probably one of the most sensible stations with plenty of readers on the platform itself, so not so much of a bottleneck. Theirs no way they would have worked up where the metcard readers are. Remember the man that had a fortune on his myki card. LOL. So they’re running the online topups the way the trains are run; one gets stuck and all the others behind it have to wait rather than overtaking at the first opportunity. We went to the city. (..as seniors we are enitiled to Free travel on Sundays) but on Sunday I used my new MYKI which I understood was encrypted with the info re Sunday travel for Seniors..imagine my suprise when checking later I found I had been charged $2.48. It turned out that the cards we had both been sent were Concession cards..Marked C..and not Seniors mark with an S…though our ages,which were given when we enrolled would have indicated our Senior status. We do the special card for Free Travel with a Metcard anyway as we have done for some time…a Myki mess !! Brian, just because you and your wife are old does not mean you are automatically entitled to seniors myki cards. Please note that people who already have free Sunday travel cards from Metlink will be sent a myki with a sunday free travel pass loaded onto it once myki is available for use on buses and trams. when is this stupid myki going to be released across all means of public transport?